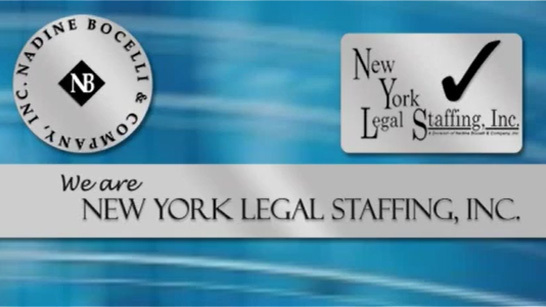 Legal Administrative Assistants – Practice Assistants – Train Legal Job Opportunities – Various Practice Areas – Nadine Bocelli & Company, Inc. – New York Legal Staffing, Inc.
College Grads/Entry Level Legal Secretary/Legal Admin. Assist. Employee-friendly law firms located in New York City are actively looking to hire on a perm or temp-to-perm basis bright, articulate, conscientious and organized Legal Administrative Assistants/ Practice Assistants. A minimum of three (3) months of law firm or legal internship experience needed. Ideal candidates must type 55+ wpm and knowledge of MS Office. Assist attorneys and paralegal staff in various practice groups with administrative and legal document production. College degree helpful. Excellent benefits upon perm hire.